It was one of those perfect winter Saturdays. A mix of plans with friends, a little baseball, a birthday party, and to top it off after coming off a few rough temperature weeks it was 35 and sunny. Heck yeah. I know, warm weathered friends, you must be chuckling at me. Yet 35 and sunny means the boys are headed outside to play, which they so crave and need. When they are outside and active everything is better. They eat better, they play better, they sleep better. All good things. It was not even 9AM and B began attempting to stuff himself in his snow gear, two legs in the same hole, obviously. Kid can snowboard down a hill (and now off ramps) but he can’t dress himself. Once properly bundled up, off they went to go up and down the big hill at least 50 times and mom got to go to the grocery story. Alone. A vacation, baby!!! With friends joining in on the sledding fun I had extra mouths to feed in other words: happiest mom ever. And again, because it was 35 and sunny (a heatwave!) M had the idea to grill hot dogs. Oh you warm weathered gals, I can almost hear you laughing at us. Things got even better when Grandad made an impromptu visit and took over the grill while I prepped the sides and…..this warm cookie skillet. 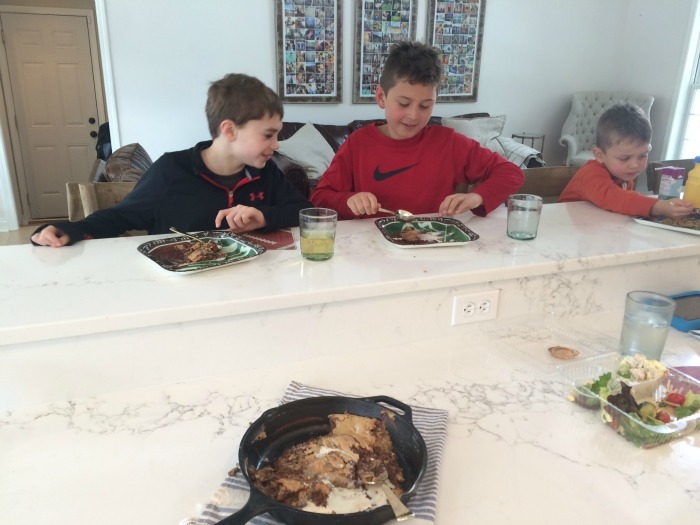 Not a typical mid day dessert in our home but a food blogger needs the natural light and I thought the pack of boys deserved a little extra special something for all the up and down on the slopes. The verdict? Gobbled. it. up. Not a morsel left. Is that really a huge shock though? It’s basically warm cookie dough with ice cream. And it gets even better – you make it all in just one dish. See that skillet in the photo? That’s the only dish you’ll dirty. Yippee for easy clean up. 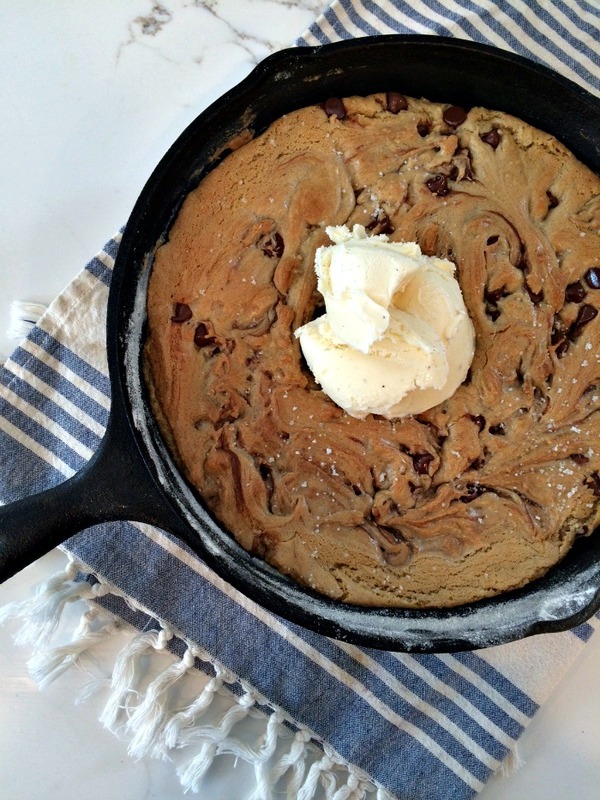 Just in time for Valentine’s Day, this warm cookie skillet is so the perfect little treat. Make it for your loved ones today! 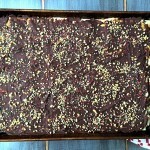 Thank you to my friend and neighbor, Tina, for the awesome recipe. 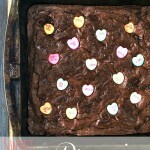 A warm and gooey treat - perfect for Valentine's Day! Preheat oven to 350 degrees. Melt butter in an 8 inch cast iron skillet set over medium-low heat. Stir in sugars and vanilla and remove from heat. Let rest until pan is warm, but no longer very hot, about 5 minutes. Crack an egg onto the butter and sugar mixture, and use a fork to whisk it into the mixture. Place flour, baking soda, and salt on top, and very carefully stir into the mixture until smooth and well-mixed. Stir in chocolate chunks. Sprinkle with sea salt. Place in the oven for 15-25 minutes, (take out earlier than later for a chewy, gooey middle) or until starting to turn slightly golden on the top and around the edges, but still soft and gooey in the center. 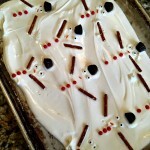 Serve with vanilla ice cream, and lots of spoons! !